This Wallet purse is made of premium leather wrinkled and crinkled in all the right places with a One of a Kind Face, hand made eyes and man made materials on the inside. This can be easily used as a wallet or a clutch! It has two main sections both of which are zippered. MOST phones will easily fit inside the zippered areas. Inside one section are 4 large open pockets perfect for a check book or to place a cell phone. This section also has seven card pockets two of which are see through I.D. slots. The second zippered section has two large slots for cash and a zippered section in the center for coins. 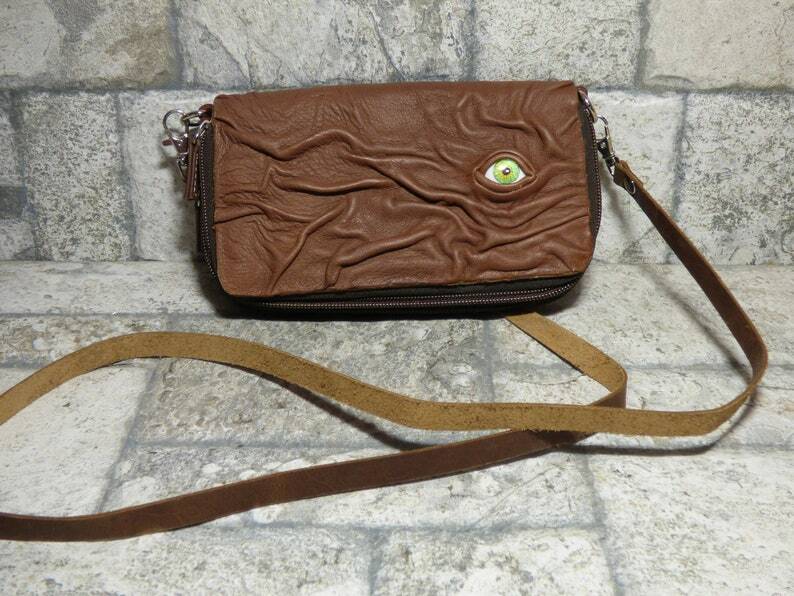 The long detachable strap is approx 45 inches long so you can wear it cross body or over the shoulder. The total outside dimensions are 7 1/2 inches (19.05 cm) across the front x 4 (10.16 cm) inches tall (when closed) x 1 3/4 (4.445 cm) inches wide. All my original pieces are signed by...me, Pippenwyck!!! I hope you like this creature!! There are many interesting things here so please, come visit Pippenwycks often. You never know what you might find... Or what might find YOU!!!! This creature is a Baggen. A whole pack of these wicked creatures slipped into our world through the vortex when it opened. I did not know they were in the cottage causing mischief until I heard the cat laughing. These wicked creatures were in the attic having a party when I caught them!! It seems they really like to party and have a good time!! I cast a quick enchantment and turned them into the first thing I thought of... handbags!! I reprimanded them all quite severely for now my attic is a mess with soda cans and cold pizza!! All the Baggens have made a solemn promise to never do such wickedness again but I'd keep an eye on them if I were you!!! They will guard whatever you put inside of them with their creepy eyes and should anyone try to see inside...Well, who knows what he might do!!! This Baggen needs a new home to terrorize...I mean...To bring joy to!!! Wouldn't you like one of your own?? ?